Pledges are now available for the first edition of Boon² happening in Bangkok city ! To attend and get involved in this edition of Boon² please secure your seat(s) with a donation. ANY AMOUNT IS WELCOMED ! • Every donation gives you access to the event for 1 person + 1 charity voucher for every ฿1,000 you pledged. If you fail to show up at the event, the total of your pledge will be automatically split equally between the charities. If you are unable to attend on the night but still would like to support this initiative, you can make a pre-donation to this campaign. Your pledge will be split equally between the charities (in this case, do not forget to select 0 as a number of attendees during the pre-donation process). 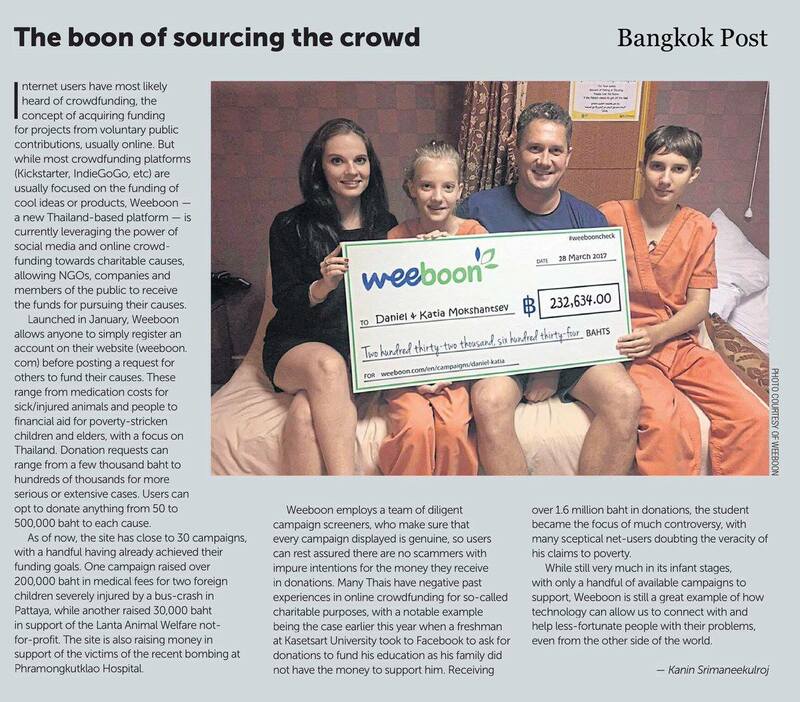 For every ฿1,000 you donated on Weeboon, you will receive one Charity Voucher which you can then allocate across the charities however you please during the vote happening right after the charities pitches. Your charity vouchers will be available for collection at the venue on the night of the event. Boon² is a new philanthropy initiative that aims to make donating fun. It provides a fresh infrastructure to young philanthropists but also creates a sustainable movement for grassroots NGOs. Based on a live crowdfunding, the concept brings together a charities pitching contest and a young professionals networking party. Each edition features a pitch from 3 charities followed by an interview from the MC and a Q&A session with the audience. Participants pre-donate a minimum amount on Weeboon.com prior to the event, receive a token (charity voucher) in return and use it at the event, right after the pitches, to decide which charity their donation will support. Event ends with a closing networking cocktail involving all the parties. Charities receive 100% of the funds raised minus a 5% project fee to Weeboon to cover admin and overhead costs. Operation Smile Thailand provides free surgeries to repair cleft lip, cleft palate and other facial deformities for children throughout the country. Dreamlopments has launched the M-FUND, a low-cost not-for-profit health insurance for migrants in Thailand, to empower this underserved population to self-establish sustainable access to quality health care services. We ultimately aim to extend this service to other migrants and underserved communities in Asia, and create a regional cross-protection scheme of health access and development. For this edition of Boon², we are pleased to welcome Khun Arch Wongchindawest who will deliver his views on social issues in Thailand. Khun Arch has worked as a consultant for UN Development Programme and UN Environment Programme. In 2013, he founded Socialgiver, a lifestyle and travel platform that revolutionized fundraising. The website and mobile app offer a range of great deals from hotels, restaurants, and activities from top brands across Thailand where 70% donated to charity. He was also featured in Forbes ‘30 Under 30’. Free flow of white wine, red wine, soft drinks and succulent food fingers provided by our generous sponsors will be served during the networking party following the end of the votes. Servis Hero is happy to reward every attendee with a surprise gift ! We look forward to seeing you at the event ! Thank you all for your participation and for making the world a better place ! excellent initiative and approach to making charitable giving exciting and providing a novel forum for young NGOs. Sounds exciting. See you there ! Great project and initiative. Looking forward to meeting the NGOs.